It is interesting that the International Civil Aviation Organization (ICAO) gives the lowest CO2-emissions in their calculator. Atmosfair gives the highest emission factors, probably because of their relatively higher radiative forcing factor (RF=3) they took into account, while most calculators and reports recommend a radiative forcing multiplier of around 2. Radiative Forcing (RF) is a change in the balance of solar and terrestrial radiation in Earth’s atmosphere (ICAO). 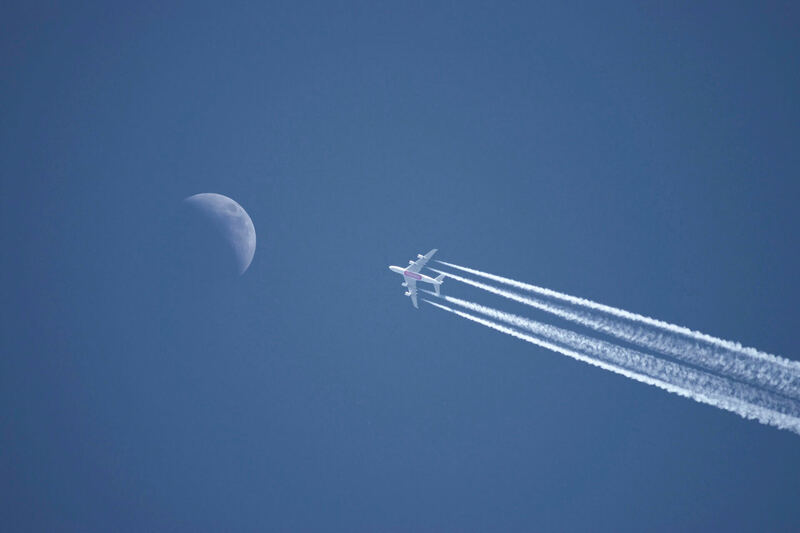 Aviation contributes to climate change by increasing atmospheric radiative forcing through the emission of gases and aerosols andchanging cloud abundance. This has a higher impact than only emitting CO2 from the ground. That's why a multiplier needs to be taken into account. As DEFRA states (in their full spreadsheet): “Organisations should include the influence of radiative forcing RF in air travel emissions to capture the maximum climate impact of their travel habits. However, it should be noted that there is very significant scientific uncertainty around the magnitude of the additional environmental impacts of aviation.”. When searching for information about emission factors there’s little amount of sources available. Mainly, the Department for Business, Energy and Industrial Strategy (DEFRA) department of the UK Government has done some great work in researching CO2-emission factors per kilometer for different distances. The current preferred definition is to assume that all fights to ‘Europe’ (or those of similar distance, up to a 3,700km maximum) are short-haul, and those that are to non-European destinations (or for flights over 3,700km) should be counted as long-haul (see report page 70). Below is a comparison of the Dutch (Milieucentraal.nl) vs UK (DEFRA) emission factors in CO2-equivalent (CO2e) per passenger-kilometer (pkm). A CO2-equivalent can also include other greenhouse gases like methane, converted to its CO2-emission equivalent. The methodology/basis of allocating flights in short-haul, long-haul, and domestic has been unchanged since 2013, and it is up to users of the GHG Conversion Factors to use their best judgement on which category to allocate particular flights into (DEFRA methodology). Milieucentraal.nl is unclear about the exact difference between flight classes, radiative forcing factor used and the validity of these values. Given the larger substantiated reports of DEFRA and the fact that DEFRA is a governmental instance, we choose for the use of their data. Large amount of factors involved like seating class and distance. Given the initial focus of FlyGRN on the Netherlands, UK, and Europe, this data can be easily extrapolated. Also, for flights outside Europe the FlyGRN CO2-calculator is in line with other calculators. Well-argued in a substantial report and methodology paper (see DEFRA methodology). The data is published by a governmental organization, so the risk of commercial interference is smaller. This data includes take-off, landing, circling and non-direct routes (e.g. with storm). That is why the emission factors are multiplied by 1.08, also known as the uplift factor (page 78). Although, DEFRA has an additional column for international flights outside the UK. If we were to use this column, the distinction between small-haul, long-haul and domestic were lost. That is why we don’t use the international emission factors, but the domestic, short-haul and long-haul emission factor. These factors are significantly higher for domestic flights (<700 km) and small-haul flights (<3700 km). Given above clarifications and our average higher values, we’re confident that we’re giving more accurate values than most of our competitors. Regarding reliability of the data, Atmosfair states: “It is clear that only the likely climate gas emissions of a flight can be calculated. If the aircraft must circle due to icy runways or if the occupancy is exceptionally high or low, the calculator cannot take this into account. In this respect, the emissions calculator’s results cannot be as exact as directly measuring the emissions on-site. However, in general, its results should correspond well with reality due to the range and quality of the underlying data. How do you define domestic, short-haul, long-haul and international flights? Broadly speaking the definition of domestic flights, are those within the UK, short-haul are those within Europe, long-haul are outside of Europe and international flights are those between non-UK destinations. Since first class and business class seats take up more space, they have a relatively larger carbon impact in flying. FlyGRN takes these factors into account. When taking into account different seating classes we use these factors. While domestic flights only account for flights within the UK, it’s assumable that a flight from LHR to AMS (380 km) has the same emissions as from LHR to NCL (390 km), when using the same aircraft. Since specific aircrafts are used for these short flights, we’ve chosen to give short flights under 700 km the same higher emission factors as domestic UK flights. Given the relative larger time busy landing and take-off for regional flights and the smaller aircrafts used for these flights it seems reasonable to include a higher emission value (as the Dutch Milieucentraal.nl does). The above values are in line with the Dutch Milieucentraal.nl. It’s a pity that CO2-calculators vary in CO2-emission values. By not using one standard it's hard for customers to see what their exact environmental impact of flying is. On top of that, some commercial CO2-calculators do not describe the sources that they used in order to come up with a CO2-emission value. Also, it’s remarkable that the ICAO uses the lowest CO2-emission factors. Since radiative forcing adds another 90% of CO2-emissions, it seems that the ICAO is not including radiative forcing. These calculations are probably most valid for Western-Europe and western countries given similar modern airplanes. These factors might be less accurate for airlines that have an older fleet, and thus have higher offset factors. There's uncertainty about the right radiative factor. As Treehugger.com states, depending on the particular study you look at an RFI of anywhere between 1.2 and 4.7 is appropriate. The RFI for aviation emissions was estimated by the IPCC to be 2.7 with an uncertainty of ±1.5 (IPCC, 1999). In other words, the IPCC estimated that total RF of aviation was 2.7 times that of just CO2 emissions from aviation (CO2 Offset Research and Carbon Independent). When the IPCC estimates were updated, RFI was calculated to be approximately 2 (Sausen et al., 2005). This estimate is in the same order as the UK Government (DEFRA) and FlyGRN uses (1.9). E.g. Flight AMS > Jakara / Bali. Shows direct flight, but makes a stop to refuel. That divides the flight into a short-haul + long-haul flight that would slightly impact the carbon emission factor. Since we’re limited to having data about such ‘direct’ flights with stops, this factor isn’t fully accurate.